It’s happened to everyone at some point. You’re struggling to get a couch up the stairs, and then its leg catches. Before you realize it, you’ve torn the paint right off and left a nice long streak along the wall. After injuries, property damage is the biggest potential bummer of move-in day. It’s frustrating, potentially expensive, and demoralizing: you just got here, and already you’re tearing the place up! 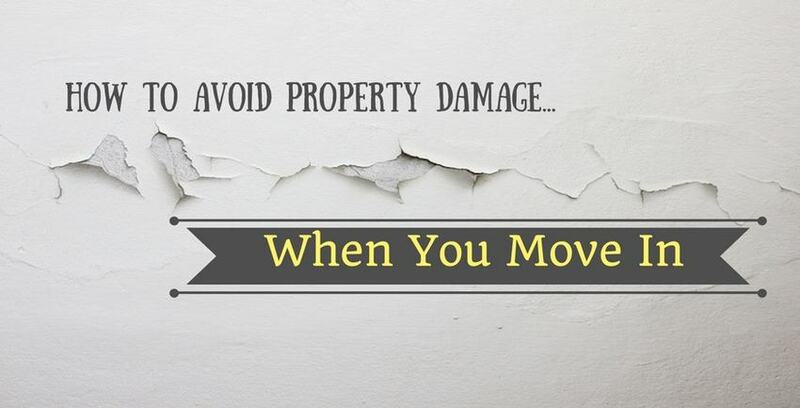 Most moving-related property damage happens either because the movers were moving too fast or weren’t paying attention. It’s hard to blame them; everyone knows moving day can be stressful. The best way to beat moving stress and stay safe is to be prepared. If you follow these steps on moving day, you can ensure everything gets where it’s going without dings, dents, or damage. The stuff that usually causes the most damage on move-in day are the big ticket items like furniture. Couches, chairs, tables, wardrobes–that sort of thing. Furniture can be big, heavy, and hard to maneuver. The harder something is to control, the more likely it’ll end up denting the wall or ceiling. Usually, what happens is part of a piece of furniture, such as the leg of a couch or corner of a wardrobe will scrape up against the wall, leaving behind a streak. One way to prevent this is to wrap the corners and protruding parts of the furniture you’re handling. Use packing material and make sure the thing you’re covering doesn’t poke through. If you wrap couch legs in plastic, it will reduce the chance that they’ll mark up the wall. Bubble wrap will also pop under pressure, which will act as a helpful warning that you’re smacking something. Dropping something heavy is a very common source of both injuries and property damage on move-in day. We’ve said it before and we’ll say it again: have someone help you lift the heavy things. Even if you think you don’t need help, the heavier something is, the more unwieldy it’ll be. The more unwieldy something is, the more likely you’ll lose your grip on it. Dropping heavy things is a really good way to dent your floor–or your foot! This is doubly important when moving something that’s unusually shaped or hard to get a grip on. No one should move a couch alone, let alone something like a wardrobe or dining table. Have as many people help you with items like these as possible. Remember: taking a little extra time is always worth it when the alternative is an injury or property damage. You love those new hardwood floors, so keep them safe! One of the best ways to prevent property damage is scouting out the path you’ll take before you take it. Make sure you know where you’re going and how you get there before you pick up the 200 pound television set. Look for any areas that are going to be tricky. Measure doorways if you have to. Get any boxes, shoes, rugs, or other potential hazards well clear of the path. Let any other movers know you’ll be coming through. If applicable, lay down a tarp to help you keep your footing or to protect the floor. You’ll probably want to stay in your shoes to get the most traction possible, so cover the carpet you’ll be stepping on to keep it clean. Only proceed to move the big piece of furniture when you’re confident nothing is going to get in your way. We know it sounds annoying. There’s always that one person “helping” you move in. You know the one. They mostly stand around and drink your beer while you throw your back out lifting the TV. The “helper” defends themselves by mumbling about how they’re “making sure you don’t break anything” or something. Right. Well, despite that person’s questionable intentions, they may have a point. When you’re lifting something bulky enough to restrict your vision, you should have someone tell you where you’re going. This person should pay special attention to things that are most likely to catch on something. They’ll be able to tell you if you’re about to battering-ram the drywall with your grandmother’s chifforobe. Make sure your spotter knows that you’re not giving them a free pass out of helping. You’re counting on them, and they should know that and remember to actually watch while you and your other mover maneuver the love seat up the narrow staircase. Accidents will always happen, but you’d be surprised how much just paying attention and following these simple steps will help you prevent damage on moving day. The most important thing to remember is that there’s no reason to rush. Take your time unloading things and don’t feel pressured to make something fit that won’t. Putting a dent in a wall is a real bummer of a first bummer to have about your new home. If you’re interested in getting even more prepared for your big move, check out some of our other moving day blogs. If you need a place to keep some of your stuff before, during, or after the move, check out our facilities today. We’re sure we’ll be able to accommodate you, no matter what your needs may be. Have a happy and safe move!